You are here: Home / Tankless / Navien Tankless Water Heater: Is It The Right Choice For You? Navien Tankless Water Heater: Is It The Right Choice For You? In any home, a water heater can be a true lifesaver! It makes showers more relaxing, especially if you live in a place where it is always cold. Nonetheless, not all water heaters can perform as expected. Some can be frustrating. They can often break down and may not deliver the anticipated performance. While there are many options that will confront you, Navien is one brand that should be on the top of the list. The rest of this short post will tackle some of their notable features. We’ll also look at the Navien NPE-240-A, one of the most popular models from the company. By the time you are done reading, you will find it easier to reach a well-informed decision. 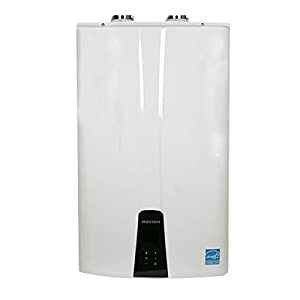 In this section, we will have a look at some of the top features that you can find across several models of tankless water heaters from Navien. These are some of the reasons why they are the favorite of many homeowners. These things separate the company from most of their competitors. ComfortFlow Technology: This is one of the defining features that you can find from Navien tankless water heaters. This is specifically present in those that belong to the NPE-A series. It is a recirculation technology that has been developed exclusively by the manufacturer. It is the first of its kind, giving Navien heaters a competitive edge. With the ComfortFlow Technology, the unit is built with an insulated buffer tank. This will provide an assurance that there will be hot water instantly available. You will not wait long before water is heated. The temperature will also remain constant throughout and will not become cold. The recirculation pump can also help save the consumption of energy since water is heated in an instant. Condensing Technology: A lot of water heaters are known for their emissions, specifically those that are powered by gas. With Navien, this is not going to be a problem. their water heaters have condensing technology, which makes it good for the environment. It significantly cuts greenhouse gas emissions when using the heater. It also improves gas efficiency. Front Panel Control Center: The water heaters from Navien are also popular for being user-friendly. They are simple to operate, taking out the complications that are common in models from other manufacturers. One thing that makes this possible is the control center that is found in the front panel. With the control panel, it will be easy to monitor the functions of the unit. It has self-diagnostics feature. This displays the error code to easily diagnose the problem. It will also show the flow rate and temperature. The temperature can be shown either in Celsius or Fahrenheit. The control panel has touch buttons for adjusting the temperature of the heater. In the models from other manufacturers, they have a dial that you have to turn to adjust the temperature. The latter can be easily prone to breakage because it easily moves. Dual Stainless Steel Heat Exchangers: The company has also built a reputation for the durability of their products. Even through the years, you can expect that they will remain functional and will not be easily prone to wear and tear. This is possible because of the dual stainless steel heat exchangers, which are known for being corrosion-resistant. A lot of cheaper models have a copper heat exchanger, which is not as long-lasting. Navien Ready-Link Technology: This is one feature that will be good for large households or even for commercial applications. With the Ready-Link Technology, you can cascade up to 16 units. As one unit reaches 80% capacity, the next unit that is linked will automatically turn on, providing an assurance that the water will remain consistently hot. Each unit will have a balanced workload, which will also be beneficial for its longevity. NaviLink Wi-Fi: This feature is common in the high-end models that you can find from Navien. With internet service, you will be able to control your water heater with your smartphone. Distance will never be a hindrance! The app is free and available for both IOS and Android. With the use of the app, you will be able to turn the heater on and off, make adjustments on the temperature, and activate the recirculation, among other things. Control and convenience are two of the things that it can offer! Without the app, you can use a remote control. The latter, however, is not included as a part of the kit when it is purchased. You will have to buy the remote separately. Energy Star: If you are concerned about the energy consumption of the water heater that you will be using, Navien can offer the perfect solution. They have Energy Star certification. This means that they passed stringent tests as the certification is issued only to products that are proven to be energy-efficient. Warranty: The warranty that is offered by Navien will differ based on the model that they have. For most of the residential heaters, the warranty will last for one year for labor. On the other hand, the parts have five years of warranty. The heat exchanger, meanwhile, is usually covered for up to 15 years. Make sure to check the terms and conditions to be eligible for the warranty coverage. The premium price of this tankless water heater can easily put some people off. Nonetheless, if you take a look at its features, you will realize that the price is easy to justify. It has innovative technologies that allow it to deliver a performance that is hard to match. Compared to most of the tankless water heaters that you can find on the market, this is quite larger. This is perfect for a large bathroom. If you have a smaller space, on the other hand, it can be too big, but this should not be too much of a problem. The installation is not the most straightforward, but this is nothing that a licensed technician will not be able to handle. It has a 2-inch venting option and 3-inch vents. It can be installed with your current ½-inch gas line. The kit is also inclusive of the hardware that you will need to complete its assembly. The front panel command center of the unit comes with a small display, which will make it easy to monitor the functioning of the unit. It has self-diagnostics, allowing you to know the possible problem based on the error codes that are shown. It also displays the temperature and water flow rate. Equipped with a stainless steel exchanger, this is also going to fare well when it comes to durability. This allows it to tolerate harsh environments, making the heater last longer. All other parts are also made in such a way that they are durable. Even if it is expensive, it will be worth your money, knowing that it is not going to quickly ask for a replacement. With this water heater, you can use either natural gas or propane. Regardless of which one you choose, it has a heating capacity that ranges from 19,900 to 199,000 BTU per hour. This is high enough to ensure the temperature of your hot water. Also, unlike others, the heat of the water will not end up fluctuating. There is also nothing to be worried about the safety of the unit. It has the standard safety features that you can find in other water heaters, which include ignition operation detector, power surge fuse, and flame rod, among others. It has an energy factor of .97 and is also Energy Star Listed. This means that it will consume minimal gas without sacrificing heating efficiency. It will allow you to save money in the long run. In sum, Navien tankless water heater is indeed an option that is hard to match. From its performance to its energy efficiency to its durability, you will have countless reasons to have it chosen above other models. With their heater, taking a shower will no longer be a struggle and will surely become more relaxing! As discussed in this post, it has top-notch features that provide their products an advantage over their competitors. The Navien NPE-240-A might be expensive, but looking at its features, it can obviously provide the best bang for the buck.